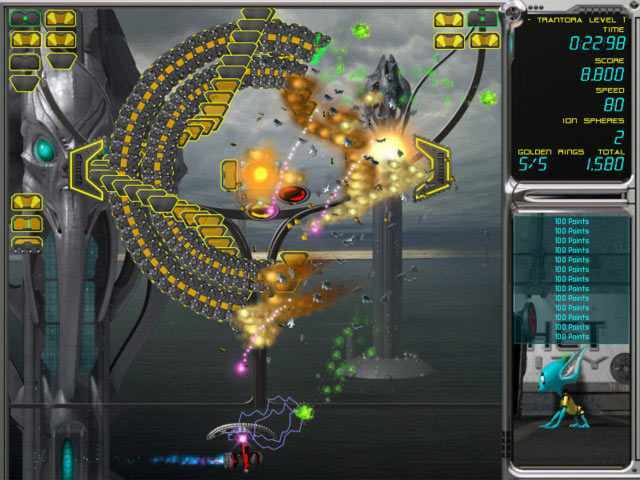 Ricochet Infinity is an action packed brick busting game requiring equal parts skill, strategy and luck. The dynamic and interactive levels reward strategic play while the arsenal of dozens of power-ups allows you to sometimes obliterate everything in your path. Many players will be content to just try to keep the ball in the air and progress though all 100 levels to see what happens next.Unlock 24 different ships each with a different specialty. Ricochet Infinity is an action packed brick busting game. ...... in hard to reach parts of the levels. The curved bumper on your ship allows you to direct the ball just where you want it by bouncing it off different edges and the iPhone's tilt sensing ability adds even more control letting you nudge the ball towards the target when it's a little off track. Download this iPhone app today to see why reviewers around the world have called Ricochet Infinity "best in class!" * Over 210 Action-Packed Levels, With 1000's More Online! * Unlock New Ships, Balls And Ranks! * Innovative Recall Feature Makes YOU The Master! * Select form four levels of difficulty including a "Kids" mode that is impossible to lose. Incredibly addictive brick busting action! The most addictive game ever made. Qweas is providing links to Ricochet Infinity for Mac 2011 as a courtesy, and makes no representations regarding Ricochet Infinity for Mac or any other applications or any information related thereto. Any questions, complaints or claims regarding this application Ricochet Infinity for Mac 2011 must be directed to the appropriate software vendor. You may click the publisher link of Ricochet Infinity for Mac on the top of this page to get more details about the vendor.